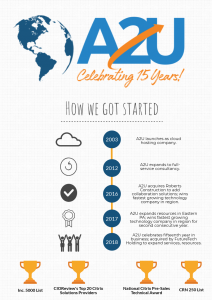 Looking back on fifteen years in business, a lot has changed at A2U. But, at least one thing has remained the same: our unmatched, top-tier technical talent. 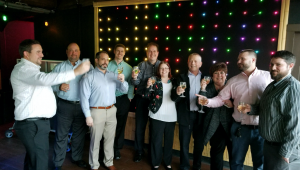 A2U staff members toast to company’s fifteenth anniversary. Over the years, we’ve moved from a home-based, three-person company to an office in Green Tree and eventually to Cranberry Township. Recently, we gave our logo a refresh, launched a new website and expanded our IT solutions. We’ve welcomed new faces and different partners. This year, marked an incredible milestone. Adding to that excitement, A2U was acquired by FutureTech Holding, a change that has positioned A2U to add new technology solutions to the mix (hello, SAP and robotics automation!) and enter new markets across the country. To say that it’s been an exciting year for our company would be an understatement. 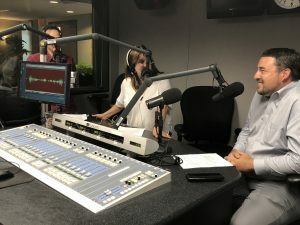 A2U CEO Dan Dillman recently sat down with TechVibe Radio to talk about the company’s history and recent acquisition. If you missed that interview, you can catch it here. In 2018, we’re celebrating a heritage of talent and accomplishments and thanking all of the folks who helped make fifteen years in a constantly-evolving industry possible – our employees, customers, partners and friends. To show our deep appreciation, we hope that many of you will join us at our biggest celebration of the year – our 3rd Annual A2U Kennywood Takeover Day! CLICK HERE TO REGISTER. The Partner Program for all IT personnel will begin at 2:30 p.m. in Pavilion # 5. This year, there will be activities for families during the Partner Program, starting at 2:30 p.m. in a nearby pavilion. Rides, games and food will be open for the main event at 4:30 p.m. All guests please park at Gate D.